If you want to get in shape but don’t want to break the bank, never fear. You don’t have to invest in a costly gym membership. You don’t need to buy the latest high-tech treadmill or elliptical machine for your home. You just need some ideas — and motivation. 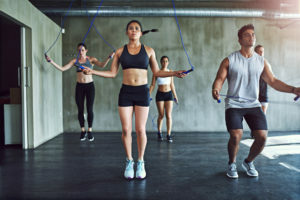 Cleveland Clinic Sports Health exercise physiologist Heather Nettle, MA, ACSM-HFS, suggests six ways to exercise that won’t strain your budget. If your doctor says you are healthy enough for exercise, get to it. Walking for 30 minutes a day can help you lose weight, control your blood sugar, and lower your cholesterol and blood pressure, and reduce stress. Can’t do 30 minutes? Three ten-minute walks per day work just as well. Cost: Invest in good walking shoes, which range from $60 to $120 at sporting goods stores and online. Running shoes work, too, but can be more expensive. Good shoes will serve you well, but be sure to replace them every 400 miles or twice a year, whichever comes first. Jumping rope is a great high-intensity cardiovascular exercise. Just 10 minutes a day will burn calories and improve your endurance. If you have joint issues, though, jumping rope won’t be for you. Look for low-impact aerobic exercise alternatives instead. 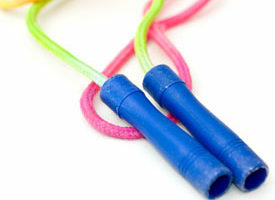 Cost: Classic, weighted or digital jump ropes will do the trick. They cost very little — from about $7 to $30 in stores or online. Using an exercise ball will help you keep your abdominal muscles, back and hips strong. It can also help you improve your balance and agility. Use the exercise ball for stretching after workouts, too. You can find good exercise ball routines online. Cost: Exercise balls come in different weights and materials and run from about $8 to $50. Printing out an online exercise ball routine will just cost you printer ink and paper. Dumbbells can help you gain strength or maintain it. Start with the weight range that works best for you without straining too much. When you feel ready, increase the load. Be careful, though — using weights incorrectly can lead to injury. Use your weights in front of a mirror to check your posture. If you have questions, consult an exercise expert. Cost: Depending on their weight and design, dumbbells range from $3 to $50 in stores. Forget past memories of gym class and focus on how well you’ll tone your body with push-ups, crunches, squats, lunges and leg lifts. Cost: This is the least expensive way to exercise. All you need are comfy workout clothes. You can lie on a clean towel or purchase a yoga mat for as little as $7 in stores. When it comes to video workouts, there’s something for everyone: Pilates, yoga, kickboxing and even dance. Cost: Exercise DVDs cost very little, considering how often you can use them. Many can be purchased for $6 to $20, and online options are growing by the day. Choose what you like and build up a collection, then vary your routine. Local libraries also carry a few choices to help you add to the variety without spending anything.